Latke Coated Schnitzel - Kosher In The Kitch! Latke Coated Schnitzel - Kosher In The Kitch! Chanukah is the festival of lights and all things fried and dusted with sugar. When it comes to celebrating the holiday, I like to think of exciting non traditional ways to eat everyone’s favorite fried food, LATKES! 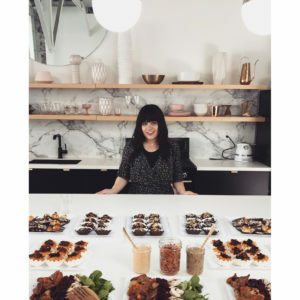 I’m often asked where my inspiration comes from when creating new recipes and the answer is usually what I am craving at the moment. In order to give the basic potato latke a makeover, I like to think of latkes like a plate of french fries or a baked potato. What do I enjoy topping those with and would it work over a latke? The answer is usually yes! For example, my nacho latkes with creamy cheddar sauce, poutine latkes with gravy, and grilled cheese latkes were all based on me taking my favorite foods and turning them into a latke. You can do it too! Instead of thinking how do I make a latke more exciting? Think of your go to comfort dish, then turn it into a latke. I wanted a tasty breakfast latke and immediately thought of sausage, eggs and hash browns then combined them all to create my sausage hash brown latkes. I love the combination of freshly steamed broccoli and creamy cheddar sauce, so naturally I threw them together to fry a batch of broccoli cheddar latkes. This Hanukkah, surprise your family by creating a holiday latke out of their favorite weekday dish. Schnitzel is a weekly must on my dinner menu. 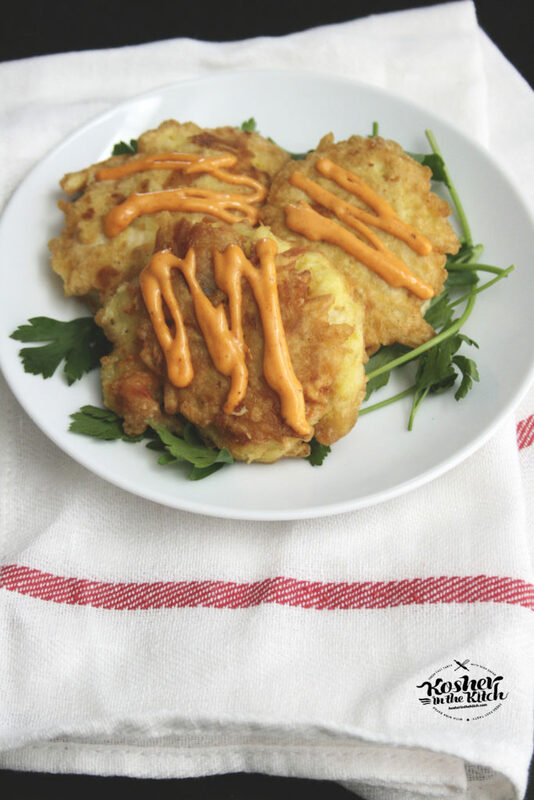 By coating it in a latke batter then frying to crispy perfection, it is now a holiday favorite as well. Combine hashed browns, eggs and 2 tablespoons flour, creating latke mixture. Dredge chicken in flour then dip in latke mixture (using your hands to coat the chicken with the potato batter) Fry chicken pieces until crispy on both sides. Optional, serve with spicy mayo. 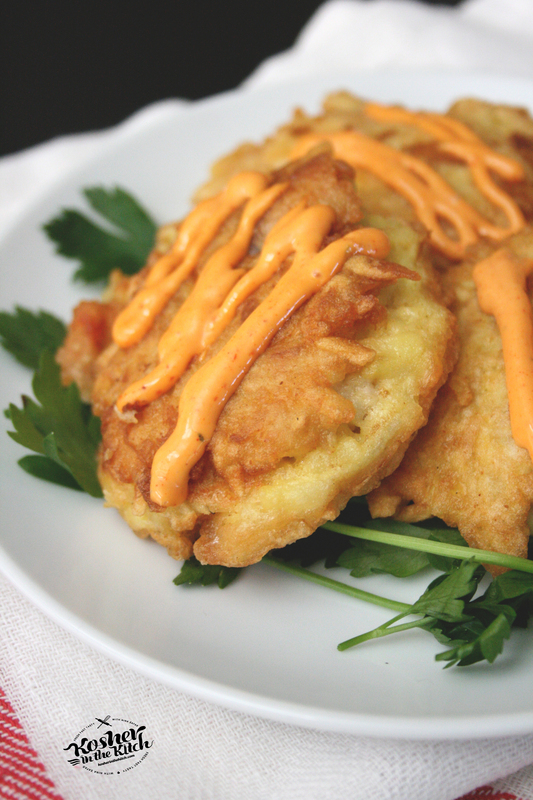 To create spicy mayo combine mayonnaise with sriracha sauce. ** This recipe was created for and originally appeared in Mishpacha Magazine Family Table. Can you please post a version of this for Pesach with fresh potatoes and potato starch? This seems like it should be adaptable, but I’m not sure of the right proportions for the substitutions. Thanks! My mom makes the BEST Passover fried chicken using potato starch, the recipe is HERE. I will try and test out a version similar to the latke coated schnitzel and see how it comes out!